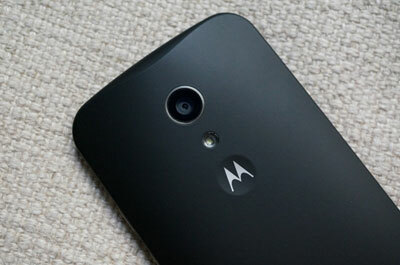 Before I start with the Moto G 2nd Gen 2014 review of the key features, I would like to add that I was really impressed with the Moto G (2013) and with the Moto G 2014 it just got better. The first time you get this phone out of the box you will notice the size and the feel it has when you hold the device. 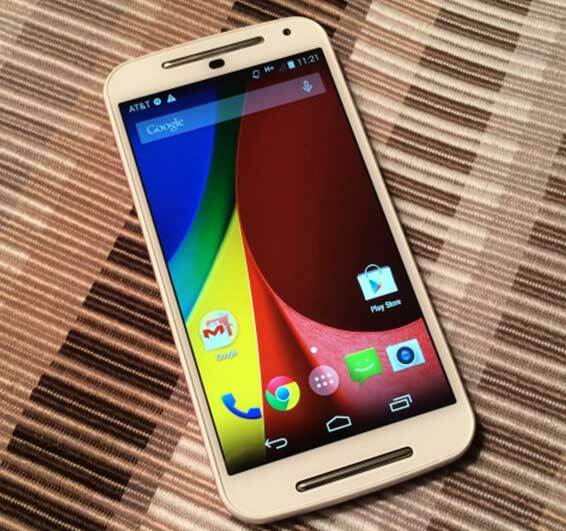 The Moto G 2nd gen has a five inch display as compared to the previous version which packed a 4.5 inch display. 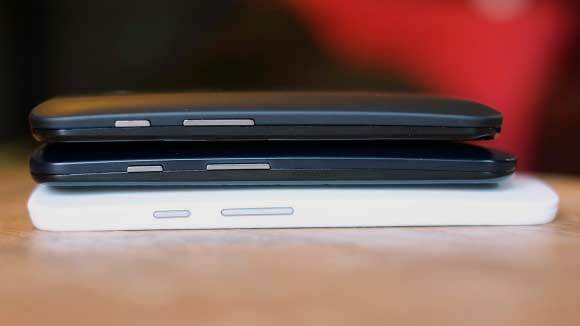 In the image above, the device right on top is the Moto E, below it is the Moto G 2013 and below both is the Moto G 2014. If you notice in the Moto G 2013 and the Moto G 2014 see eye to eye when it comes to thickness and the screen real estate on the Moto G 2014 is also relative bigger as compared to the other two. As mentioned before the screen is the main selling point of the 2nd Gen Moto G, the device houses a 5inch 720p display with a PPi of 294. Something that you must notice is that the Moto G 2013 also had a 720p display but with a 4.5 inch screen it resulted in a higher PPi density (326 PPI). The 2014 Moto G does have corning Gorilla Glass 3 which means it is resistant to scratches so don’t bother keeping it your pocket among your keys. The display type is a IPS LCD so the phone is going to do just fine outdoors, so you could switch the brightness to auto or just bump it all up and you’re good to go. The Front facing speakers, this is such a beautiful and utilitarian upgrade from the 2013 version. These speakers are much better while watching movies, YouTube or just while playing games. As long as we are on front area of the phone, your selfie shooter has been upgraded to a 2mp camera from the 1.3mp camera on the older version. Speaking about the cameras, the rear shooter on the Moto G 2nd gen has also been bumped up to a 8mp shooter as compared to the 5mp found on the rear of the older version (Moto G 2013). The cameras however record 720p videos @30fps with a HDR mode at your disposal. The memory on this phone is the same as the previous version, which is 8/16 GB onboard storage. The added advantage here is the micro SD card support on the Moto G 2nd Gen, this was my (personal) best feature on it. The storage can be expanded all the way to 32GB and no the phone doesn’t show any lags even while using a 32GB SD card. The Moto is a stellar piece of device, with a close to vanilla android look you have no lags while going through the UI and using the phone. The Phone will also be getting an Android 5 AKA lollipop official update from Motorola or Google 😛 (confirmed by Motorola).